Find hotel near Birmingham Museum And Art .. The Birmingham Museum and Art Gallery is one of the best kept secrets of the city. Situated in the city centre, what makes this place so unique is its huge collection of fine arts, ceramics, metal work, jewellery, artefacts from archaeology, ethnography as well as Birmingham’s local and industrial past, all of which are of immense global importance. It also houses an impressive collection of rare paintings from the Pre Raphaelite and Victorian eras, not to mention a sprawling decor which qualifies the museum itself as a work of art. The Museum and Art Gallery was first opened in 1885, and the building it is housed in is as much a masterpiece as the numerous displays inside. In fact, you can spot some exquisite sculptures over the entrances to the museum itself. Be sure to take at least a few good hours off if you want to experience the Museum in its full glory. Some of the exhibits are so enchanting, that you may just find yourself glued to a particularly interesting painting for a lot longer than you think! You will find that the arts and objects in the Museum span over seven centuries of European and World culture. So if you're a lover of Greek, Roman or Egyptian history, this is one place that will not disappoint you. One of the best things about the Museum is that they house many brilliant temporary exhibits on various fields. The Art Gallery has an extensive collection of paintings, from some of the most renowned painters Europe has produced. You will also be impressed by their range of artefacts, including coins from the Middle Ages and a number of relics from Ancient India, Cyprus, Egypt and Classical Greece that are over two thousand years old. Once you're finished exploring this majestic Museum, you can take a nice evening stroll along the Birmingham streets outside. You can also reminisce about the marvellous day you just had in one of the many delicious eateries that you find along the way. Also, visit the popular attractions in the city by following Birmingham itinerary 1 day. Avoid getting there too late as they are quite particular about the 5:00 pm closing time, which could lead to a rush. Don’t forget to visit the gift shop, as they have a range of good quality souvenirs at reasonable prices. The food and drink service is good, and although there are no drinks for the little ones, the staff is quite helpful and may be able to assist you with the same. There is no car park, but you can use the designated street parking or a pay and park, both of which are close by. Remember to visit the newly refurbished Tea Room, a cosy nook where you can enjoy your evening tea in classic English fashion. Allow yourself plenty of time if you’re planning to see the full museum, as it is a lot bigger and absorbing than you think! Due to the vast expanse of the museum, time your visit to each exhibit to experience them all in one day. The art gallery is famous for its collection of Pre Raphaelite paintings, which is a must for any visitor. Keep checking the official website to stay updated as they are always setting up new exhibits that may be open while you’re visiting. 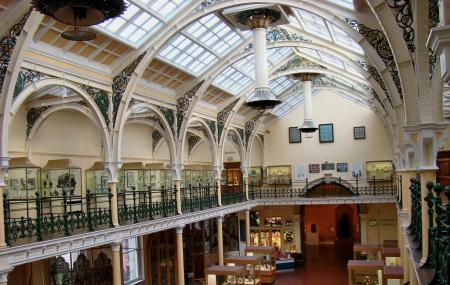 Although entrance is free, there is usually an entry charge at the Gas Hall in Birmingham Museum. Some exhibitions and events inside the premises may charge a ticket price. Walking distance from New Street, Snow Hill and Moor Street railway stations. How popular is Birmingham Museum And Art Gallery? People normally club together National Exhibition Centre Nec and Winterbourne House And Garden while planning their visit to Birmingham Museum And Art Gallery. Went to listen to the lunchtime concert. It was excellent. Baroque music played on guitars, harp and lute. Vocals were sublime. The museum continues to have other attractions that are worth a visit as is this Victorian building itself. There is a cafe and a shop too. Certainly worth a look around, and whilst not on a par with the Liverpool world museum it does have some interesting exhibits. It is set in a lovely square and is an impressive building. Current " cute " exhibition was good and very different. Kids found some of the areas a little boring and were miffed there were no dinosaurs or natural history exhibits. But overall a good mornings nosing ... And its free ! A treasure trove full of fascinating artifacts including real mummies and ancient gold! Children love the hands on activities in the local history section but the mini museum needs a bit of attention to ensure that everything works and is in good condition. Also was a bit disappointed that we had to walk through the the 'cute becomes sinister' exhibition to get to the mini museum. Maybe having something more child friendly on over the easter holidays. Last time I visited the museum must have been at school visits. Not really appreciated then what we truly have. I mostly enjoyed seeing in front of my own eyes was the "Staffordshire hoard" ancient find, hundreds of years old ,magnificent gold,silver and multiple coloured gems. Definitely worth a visit and FREE entry and very helpful and friendly staff.